Perhaps it’s no surprise that cells are very diverse in their shapes and functions. Even stem cells have diverse needs and environmental conditions depending on what types of cells they make in the body. This diversity can make studying some stem cells particularly difficult, such as cardiovascular/heart stem cells, cells that make the major cell types of the heart. However, researchers at Leiden University Medical Center in the Netherlands have created a way to grow and multiply (expand) these cells, without change, until instructed to by the researchers. They also show they can direct these stem cells to make three types of heart cells. Notably, these researchers are the first to have made specialised cells similar to those found in the natural pacemaker of the heart. Some types of stem cells are naturally ‘pluripotent’, meaning they have the ability to grow and multiply to make other cells as well as more of themselves. The process of making more copies of themself is a process called ‘self-renewal.’ Stem cells in all tissues are scarce. So self-renewal is essential for stem cells to continue to make the new specialised cells the body requires to function, as well as copies of themselves for future needs. Often when growing pluripotent stem cells and adult tissue stem cells in a laboratory, researchers at first only have a small number of purified cells to work with. 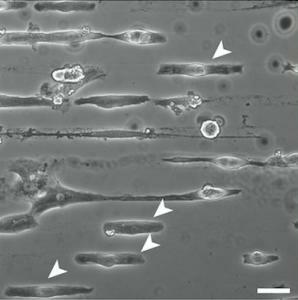 Researchers rely on the ability of these cells to multiply through self-renewal to get enough cells to carry out experiments. However, the tissue stem cells in some organs, like the heart, lose their ability to self-renew over time, making it extremely difficult to have enough cells to study. This also prevents researchers from creating enough cells for medical treatments of the heart that researchers hope to use in the future (more on this below). In addition, it has been very difficult to make pacemaker cells, cells that control the way the heart beats. This difficulty has greatly slowed scientific advances in understanding why some people have abnormal heart rates (heart arrhythmias). These two issues are, to say the least, very big problems. The aim of Birket and colleagues was to develop a new method for growing these heart stem cells, which both preserves the ability of cells to self-renew and tightly controls when these cells can differentiate into other types of heart cells. Laboratories have previously generated heart stem cells from human induced pluripotent stem cells (hiPSCs) and human embryonic stem cells (hESCs). However, as mentioned above, these cells quickly lose their ability to multiply and self-renew, making them difficult to study. Birket and colleagues discovered a method to ‘capture’ cardiovascular precursor cells (heart stem cells) in a state where they continue to self-renew (i.e. stop them from differentiating). The research group achieved this by inserting a small modification into hiPSCs or hESCs. This modification allows the researchers to control a cell’s production of a protein called MYC. MYC is a very important protein that increases a cell’s ability to keep genes turned on or turned off in the cell. Too much or too little MYC can be bad, so controlling how much MYC is in a cell is important. Some of the genes MYC helps regulate include genes involved with self-renewal. The researchers found that by increasing the amount of MYC in heart stem cells at a specific time, they could keep growing the cells without them rapidly differentiating. Another major achievement reported Birket and colleagues is their ability to turn these stem cells into two specific types of heart cells. One type of cell they can create is very similar to the cells found in the sinoatrial node, the natural pacemaker of the heart. They created these specialised cells by controlling how the cells respond to the presence of two different types of proteins, called bFGF (basic fibroblast growth factor) and BMP (bone morphogenic protein). The researchers’ accomplishments certainly won’t end here. Birket and colleagues’ ability to create controllable heart stem cells will certainly help them figure out in future research what other proteins and growing conditions are needed to make the many other cells found in the heart. This video shows two different types of cells the researchers were able to make from the heart stem cells they created. The first cells are similar to muscle cells found in the walls of the heart. The second cells shown are similar to cells found in the natural pacemaker of the heart. Notice the difference in the rate the cells contract. Scientists and clinicians believe stem cells will be revolutionary in creating future regenerative medicines, but there are still problems with using embryonic stem cells and induced pluripotent stem cells as medicine. The largest problem is that these cells can produce any type of cell found in the body if not properly controlled. Simply putting these stem cells into a patient ‘as is’ could create the wrong types of cells or possibly even grow cancer. This obviously would make things much worse for a patient, not better. In contrast to this scenario, the heart stem cells (cardiovascular precursor cells) developed by Birket and colleagues only make cells found in the heart. Although stem cell treatments for the heart are many years away, determining this kind of control over stem cells is one more step toward making safe and reliable stem cell treatments. It is important to note that the researchers also demonstrated that they can use human induced pluripotent stem cells to make these controllable heart stem cells. This means that cells from a patient’s skin could be used to make heart cells specific to a patient’s genetic background. These ‘model’ heart cells then can be examined in a laboratory to get a better understand of what might be going wrong with the patient’s heart. This is the next-best-thing to getting an actual sample of cells from a patient’s heart, but much less invasive. Additionally, doctors could use heart cells grown in the lab to test in advance if medications will work well or if a patient will have adverse side effects to different medications. The researchers determined a method to ‘capture’ heart stem cells, called cardiovascular progenitor cells, in a state where they can continue to multiply. This video shows a single cell becoming a ball of many cells over several days. All the cells are exact replicas of the original single cell. Christine Mummery, the lead investigator of this heart stem cell project, is particularly excited about their ability to make specific heart cells, like those found in the natural pacemaker of the heart. She points out, “We can make pacemaker cells from human induced pluripotent stem cells (hiPSC) from patients with abnormal heart rhythm and try to figure out why. [This] also means longer term, we might be able to transplant new biological pacemakers into the heart.” Although using a person’s own cells to regrow a natural pacemaker is many years away from being a medical procedure, the thought of it sounds amazing compared to the artificial pacemakers we have today! This summary is based on the original article ‘Expansion and patterning of cardiovascular progenitors derived from human pluripotent stem cells’ by Matthew J Birket et al., Nature Biotechnology 2015. A journal subscription may be required for access. Christine Mummery has also contributed to writing two review articles (1, 2) discussing more about where cardiovascular progenitor cells come from and what cells in the heart they can make. A journal subscription may be required to access the second article. Wikipedia offers a description of what the different proteins mentioned in this article do in cells and the body. However, these are rather technical descriptions. Myc , bFGF (basic fibroblast growth factor) and BMP (bone morphogenic protein). Written by Ryan Lewis, edited by Jan Barfoot, reviewed by Matthew Birket and Christine Mummery. All images and videos are used by kind permission of Matthew Birkey and Christine Mummery, Leiden University Medical Centre, The Netherlands. Supported by PluriMes (Pluripotent stem cell resources for mesodermal medicine).